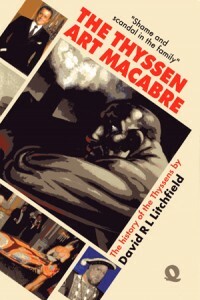 The Thyssens have always denied the full extent of their Nazi past. Heinrich Thyssen-Bornemisza’s side of the family achieved this by camouflaging his supportive industrial and banking facilities behind a dubious Hungarian nationality and Swiss residency, while claiming his brother Fritz to have been solely responsible for what little collaboration with the National Socialist regime the family was willing to admit. The fact that Fritz Thyssen had co-operated with Emery Reves on a book entitled „I Paid Hitler“ made it easy to divert the spotlight onto his side of the family. To save his own skin, Fritz and his lawyers alleged that the book had been authored by Reves rather than himself and that the representation of his guilt was grossly exaggerated. This strategy had some success and, at his denazification trial, Fritz Thyssen was judged to have been a „minor Nazi offender“. A recent book funded by the Fritz Thyssen Foundation (Felix de Taillez: “Two Burghers’ Lives in the Public Eye. The Brothers Fritz Thyssen and Heinrich Thyssen-Bornemisza”. Schöningh Verlag Paderborn), however, finds that an investigation by Norman Cousins in 1949 showed conclusively that „I Paid Hitler“ was much more authentic than Fritz Thyssen and his lawyers had argued. Nonetheless, following Fritz Thyssen’s death, the executor of his will, Robert Ellscheid, in close co-operation with his unrepentant widow, Amelie Thyssen (an ex Nazi-party member from 1931 onwards), set the family firmly onto a path of uncompromising historical obfuscation. de Taillez eventually concludes: „The public rehabilitation of Fritz Thyssen was practically complete in 1959/1960 when Amelie (Thyssen) and Anita (Zichy-Thyssen) together put shares in the amount of 100 Million Mark into a charitable foundation for the promotion of scientific advances bearing his name, in order to give the remembrance of the deceased a permanently positive image“. And finally: „The work of the foundation came soon to be recognised in Germany as well as abroad and thus the long shadows of Thyssen’s Nazi past disappeared from the public domain“. In other words, the Fritz Thyssen Foundation now concedes that the Thyssen family had a darker Nazi past than previously admitted, that it made a conscious decision to white-wash Fritz’s (and by extension the whole family’s) Nazi past, and that the foundation played a role in doing so. Thus the Thyssens and their advisors, in an unscrupulous and unjustifiably domineering way, once again abused the German nation for their own self-serving purposes. We call upon the German government to take this admission by the Fritz Thyssen Foundation, as well as our findings on the Thyssens’ support of National Socialist rule, into account when updating its position on the investigation of Nazi continuities in public life, Holocaust Remembrance and other related issues. Thirty years ago such a request would have been unthinkable but now we feel entirely confident that the academic revelations made are coming about as a direct result of our investigative, historiographic and journalistic endeavours, over the past 25 years, concerning the history of the Thyssens, and that it was this that has obliged their corporate, if not their private, public relations machine to change direction. As we have no intention of reducing our pressure on the Thyssen complex, it seems more and more likely that the family will indeed, eventually, be obliged to adopt a modern-day policy of full disclosure concerning their tarnished past, which will advance immeasurably our understanding of that period of history. The Thyssen smoke and mirror constructs of the past 70 years are still being maintained to some extent and the breadth of material in the public domain that needs to be corrected is vast. But the first official step towards historical candour has now been made and our satisfaction in having played a part in bringing about this U-turn is immense.